These are tidal marshes beside our house in late afternoon Summer light. From my studio I can look across to this line of Monterey pines, and the sunlit rocky island called Ireland's Eye. 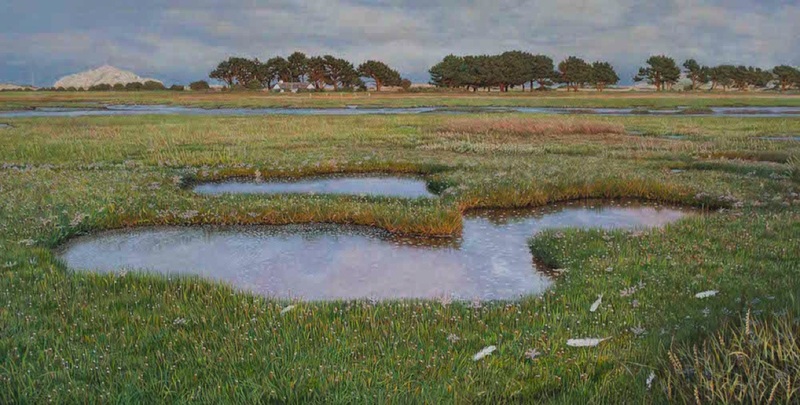 The marsh vegetation forms what are termed 'salt meadows'; they are home to hundreds of waders, and one the the world's important migrations of Greenland light-bellied brent geese winters here. Finding the little egret feathers beside this tide pool gave birth to the impulse to paint the moment of the complete isolation and silence of the evening marsh. The feathers became one of those 'presence of absence' moments. It took me some time to find this trefoil-shaped tide pool that I had painted in an earlier winter. It was a strangely emotional discovery.